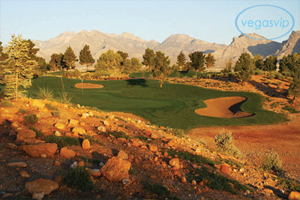 Surrounded by the amazing Red Rock Mountains and a scenic Las Vegas Valley, Angel Park Golf Club is so beautifully serene it's almost picture perfect. This elite club is the great escape a true golfer could appreciate. Designed by Arnold Palmer and Ed Seay, Angel Park sits at three thousand feet elevation. The well designed landscaping and choice of complex courses gives an added touch to play, whether it is a competitive tournament style, or a laid back individual one on one competition. This elite club brings a definite magic into the game by giving light to golfers in both their Cloud Nine and Putting Course, which features the world's original natural grass. Golfers do not need to worry if their schedule does not permit them to play in the traditional day time hours because these two specialty courses were specifically designed to allow the golfer to experience some true night time action. Competitive and elite, Angel Park's courses are not limited to pro-play. People of different ages, backgrounds and playing skill level have the opportunity to enjoy the luxurious club. The unique staff was personally selected with the golfer in mind. They are friendly, motivated and dedicated to making sure that their guests come first. Thursdays are set aside each weak for you to enjoy a fun opportunity getting to know the employees by joining them in playing a round of golf. They are not just fun and personable but they believe that the players are what make the course so unique. To show their appreciation to their loyal customers, the staff has created a special "Golfer of the Day" program designed to give everyone an equal opportunity of being singled out and appreciated. If you are chosen, the lucky guest will receive two drinks, a free entrée at their amazing and delectable restaurant and a complimentary green fee! What better way to say thank you? Please keep in mind though that Angel Park Golf Club does abide by a strict dress code, so do not wear denim or swim suit attire. Short shorts or tanks tops are not allowed. Only mid-length shorts, pants and a crisp collared shirt or even a sleeveless blouse of a conservative design are permitted. Non-metal spikes MUST be worn and if you don't have any they are available for purchase for ten dollars. If you have any questions or concerns regarding the dress code attire, feel free to contact the main office directly. Red Rock Canyon has a beauty that is beyond comparison. Sometimes it's nice to take a break from reality, to experience life's small pleasures. This course has not only something for everyone but teaches us that Las Vegas can be diverse and complex in their scenery. Golfing at Angel Park is just the pleasure you need to keep you going and gives you just the right amount of peace and quiet in a town that's known to be nothing less than chaotic. This club is a definite must see to believe!